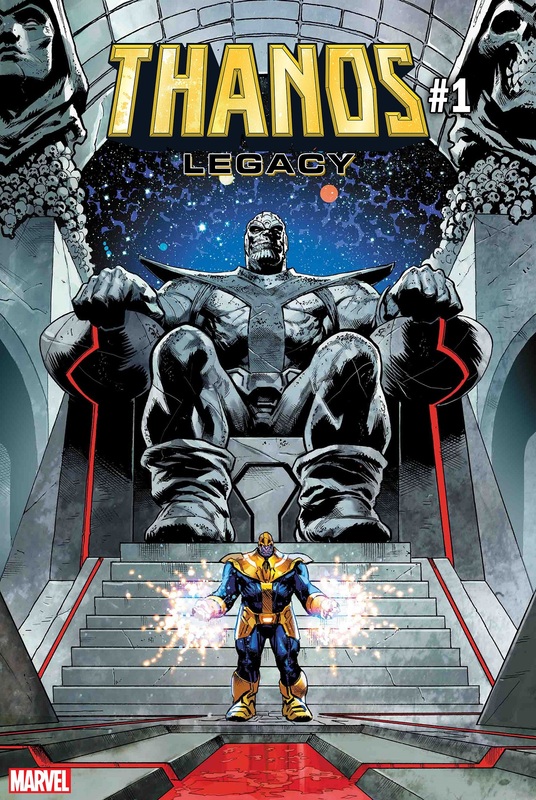 Writers Donny Cates and Gerry Duggan will team with artist Brian Level for Thanos Legacy #1, a one-shot detailing what happened to the Mad Titan following Cates’ “Thanos Wins” story arc, along with the villain’s connection to Requiem, the mysterious new character playing a role in Infinity Wars. Cates and Shaw’s run on Thanos introduced the Cosmic Ghost Rider, who traveled to the present-day to bring the Mad Titan to a dystopian future where he ruled as King Thanos. Future and current-day Thanos’ fought together against the Fallen Silver Surfer before our Thanos murdered his future counterpart, all for the hand of Lady Death. Requiem is billed as the primary antagonist of Infinity Wars, which will spin out of the Infinity Countdown miniseries that sees heroes and villains from across the Marvel Universe vying for the six Infinity Stones. Thanos Legacy #1 by Donny Cates, Gerry Duggan and Brian Level goes on sale September 5 from Marvel Comics. The post Thanos Legacy One-Shot Will Reveal Connection to Infinity Wars’ Requiem appeared first on CBR.